The book "Log Home Secrets of Success" is a clearly-written guide, taking you step-by-step through the entire process of buying or building a log home. It takes an unbiased approach based on the author's experience dealing directly with the people who know that process best: log home owners themselves. The author, Roland Sweet, developed a series of themes based on interviews, conversations and interaction with potential log home buyers as well as those who have been through the process and are now living in their log home. He shares their insights into what they would do differently and what worked well for them. The subtitle of the book sums it up quite nicely: Log Home Secrets of Success: An Insider's Guide to Making Your Dream Home a Reality. The author’s long experience in the log home industry enables him to focus in on the practical real-world issues that potential log home owners will face, things like covenants and restrictions on a potential land lot, assembling a team for your build including architect, builder, general contractor, log manufacturer and landscape designer. By understanding the process of buying land, designing the log home, buying the package, then building, furnishing and landscaping, the homeowner can follow each step and provide guidance and direction until their dream log home is complete. This book provides a refreshing look at the log home buying process, from cabin design to comparing log home packages by cutting through the hyperbole and misleading statements used by log home companies to sell their own products. Sweet shows which details are most important and which can lead you off the trail and through the woods on a fruitless and frustrating chase. One insight in “Log Home Secrets of Success” that resonated with me was Sweet’s idea that your goal is to live in a log home, not just to build one, but it’s easy to get lost in the complicated process of building or buying a log home. Just as we try to do in Log Cabin Connection, Sweet endeavors to make sense of the whole process, breaking down the steps into manageable elements to make the journey easier. He advises not to be discouraged by all the noise surrounding different log systems, wood species, notches, chinking and checking. Log homes are much like stick-built homes in the mechanical structure, with a few key details to address. But wanting a log home is a passionate, emotional decision and the ultimate goal is to live in a log home. The journey may be enjoyable – or not – but the destination makes it worthwhile. You can make the process more enjoyable by focusing early on good log cabin home design and trusting your log home company with drying techniques, dealing with log settling, the characteristics of the particular log type they carry and other detours. 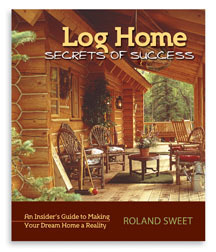 Several appendices in "Log Home Secrets of Success" include additional information. “Preserve Your Home’s Good Looks” tells you what to watch for and how to protect your log home from future decay and log repairs. “Warranties: Buyer Be Wary” covers the confusing and misunderstood world of homeowner warranties. A breakdown of the building sequence along with the responsible party for each activity clearly lays out the build process for homeowners who may be interested in acting as their own general contractor. Finally, for homeowners seeking multiple bids on construction and needing a handle on expenses, there is a cost estimating checklist that also serves as an overview of each discrete phase of construction. By focusing your attention on the pertinent facts and issues surrounding log homes, the author shows how you can not only have a more enjoyable journey towards owning your own log home, but you will also end up with a valuable legacy that you will treasure and hand down to your family. The book "Log Home Secrets of Success: An Insider's Guide to making Your Dream Home a Reality" by Roland Sweet is published by and available from PixyJack Press, a solar and wind-powered independent publisher publishing books about hydrogen energy, solar power, wind power, Costa Rica rain forest, global warming, people and black bears.